It was what came after that brought me to tears...well done Mr. Witt, very well done. You'll probably notice that I say this a lot...but once again my decision to start reviewing audio books has enabled me to get to a story on my TBR list that I keep squirreling away from. There's no insult intended to anyone because this is just how I am. I actually do this with some of my favorite authors and have done it for my entire reading life. I read a lot and I also buy a lot of books and I squirrel from book to book a lot. Which ironically in spit of the fact that I own 10 of this authors titles makes this the first story that I've actually read...errr, listened to. Anyways, enough about my strange reading habits and I'll get back to the real issue at hand here...'The Imperfection of Swans'...wow, what a truly beautiful story. Kevin has always wanted to open up his own bridal store and Casper loves to bake and having his own bakery that specialized in wedding cakes would be a dream come true for him but it's not until these two meet and an acquaintance suggest that they need to partner up that both men begin to believe that they really can have their hearts desires fulfilled. Kevin is both heartbreaking and inspiring. His constant struggle to maintain what he perceives to be the necessary image and to keep himself from falling victim to the harmful effects of his choices made my heart ache for him and in the end his efforts to finally acknowledge and break the cycle of harmful behavior that had ruled his life took so much courage. Yes, he had an amazing support system and I was so happy for that but still ultimately it was Kevin and only Kevin who had the ability to change things for himself and the strength that is needed to do this and succeed is so amazing. I loved Casper...was he perfect...no, but, he was perfectly wonderful and most important of all...he was perfect for Kevin. He loved and accepted Kevin warts and all and really can any of us every truly ask for more? There were more than a few awesome secondary characters in this book and for the most part I loved them. From Kevin's family to his ex, who I was happy to see wasn't portrayed as a bad person so much as the wrong person for Kevin. I'd actually like to see that character have a novel where he gets his own happily ever after. I'd also like more about Kevin's Uncle Tony and his husband and Casper's ex not-ex Brent just needs to go away...like I said a lot of interesting secondary characters in this one...the guy that ran the Sushi place? Seriously what was up with him? I'm sure it's no real secret by now that the character of Kevin is based on the author's best friend and while the story got more than a few tears from me it was the comments of the real Kevin and the author that were read after the story that brought even more tears to my eyes because I was yet again reminded that Kevin, the real Kevin is truly a brave soul to share what was both a difficult and trying experience with the world is not something that a lot of people would be comfortable or willing to do. It takes strength to do this especially when you consider that the handsome young man on the cover is the real Kevin. So admittedly the story itself was probably a 4 star read for me but when all this is factored in I can in all honesty give this no fewer than 5 glowing 'you've wowed me' stars. So where does that leave the audio book? Kirt Graves was the narrator for this one. His voices are expressive and have the discernible difference allowing me to listen without difficulty or losing track of who's speaking and questioning which voice is whose, I had no problem staying engaged with the story. In general this narrator works for me and while he's another new to me narrator, based on this book and the samples from a couple of his other books that I've listened to he's someone that I'll look forward to hearing more from in future. 'The Imperfection of Swans' is a story that deals with some really tough issues with insight and sensitivity by a 'new to me' author and narrator who made for a really enjoyable combination. 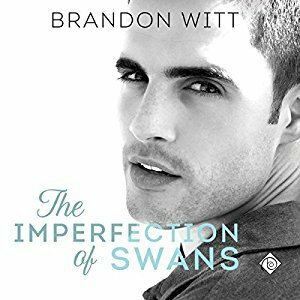 An audio book of 'The Imperfection of Swans' was graciously provided by the publisher in exchange for an honest review.